This is what The Joker looks like without that gaudy purple outfit. Here he is draped instead in runway looks from brands like Raf Simons, Supreme and Thom Browne. 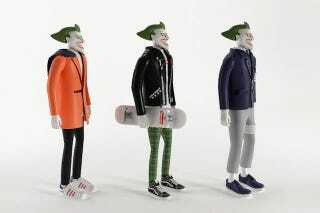 Georgiev modeled the villain's clothes from looks straight off the runway, with The Joker's orange Simons' jacket appearing in the Belgian's Spring/Summer 2015 show. The Joker's Thom Browne cropped suit is also a replica of one seen in the designer's Spring 2015 collection. Lastly, The Joker's Supreme outfit is comprised of an iconic box logo tee, Saint Laurent leather jacket, and the streetwear brand's 20th anniversary skate deck. Cool, I guess. Nice way to accentuate that great smile of his.